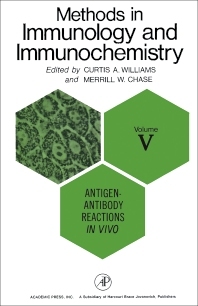 Methods in Immunology and Immunochemistry, Volume V: Antigen-Antibody Reactions In Vivo deals primarily with immune phenomena in tissues or in cell preparations. This book covers a variety of topics, including anaphylaxis, tolerance, immune suppression with chemical agents, radiation effects, antibody synthesis in vitro, immunological methods, and applied electron microscopy. Organized into 10 chapters, this volume begins with an overview of systemic anaphylaxis investigations in other more resistant species. This text then presents the analysis of mechanisms involved in the pathogenesis of the Arthus phenomenon, which shed light on the understanding of other lesions of hypersensitivity. Other chapters consider the effects of antigen–antibody interaction on connective tissue. This book discusses as well the degree and duration of acquired tolerance. The final chapter deals with the application of electron microscopy in the elucidation of the mechanisms of immune reactions. This book is a valuable resource for immunologists, students, and research workers.